Lark Design Make will be offering a fabulous range of sewing and craft activities this Whitsun Holiday. The workshops are suitable for 7 - 12 year olds, there will be 2 craft instructors, both have DBS certificates and one has a full first training, they have extensive experience in a range of sewing and craft activities. The minimum group size will be be 3 and maximum 10 so participants will have excellent opportunity to gain new skills and make new friends. Craft club starts at 10am and finishes at 3.30pm and your child will have a minimum of 2 hand made products to take home and lots of stories to tell about their day. Each day will start with a sewing project where they will take home a finished, individual & most importantly a useful product. The sewing projects are suitable for absolute beginners but they are also adaptable if your child does have experience of using a sewing machine and would want a more challenging project. At around 12.15pm we will break for a 45minute lunch break. Cardiff MADE will provide a delicious vegetarian lunch, sweet treat and drink for an additional £4.50 or your child can bring a packed lunch. We will all eat together and if the weather is nice we will sit in the cafe garden to encourage new friendships. After lunch there will be different craft activities involving new skills and a take home product. Is early drop off or late pick up available? We are happy to organise a independent craft activity and supervision for a small charge. Please contact Gemma on larkdesignmake@gmail.com with the times and dates and we can discuss. 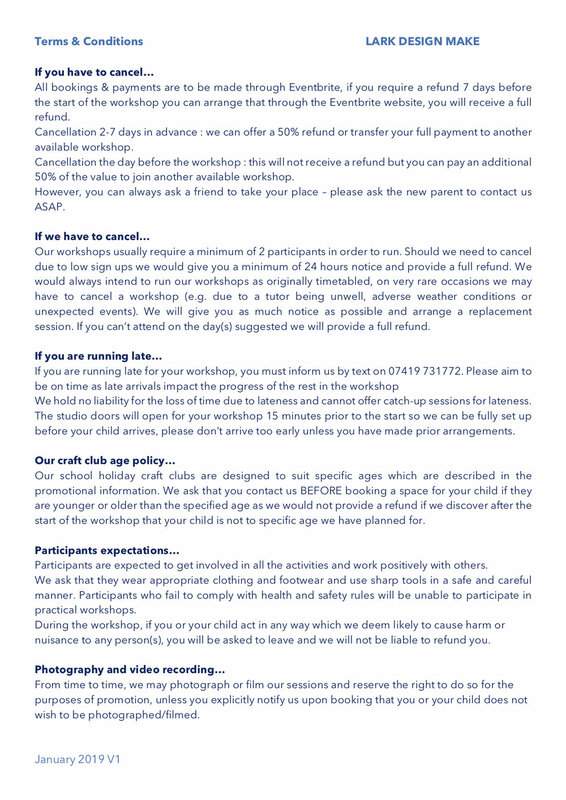 •Please see the attached TERMS & CONDITIONS document, it includes details of Lark Craft Club policy on cancellation, refunds, expectations and photographs etc... We will also email this to you after your booking along with a short survey of your child's details so we are prepared for our exciting day(s) of crafts. •What does my child need to bring to the craft club? •All materials for the craft workshops will be provided and everyday they will have at least 2 handmade products to bring home. •The only thing they may need to bring is a packed lunch but you can opt for a lunch made by the Cardiff MADE café for £4.50, you will be emailed to make your selection after booking. •My child is older or younger than the 7-12 age group, can they attend? 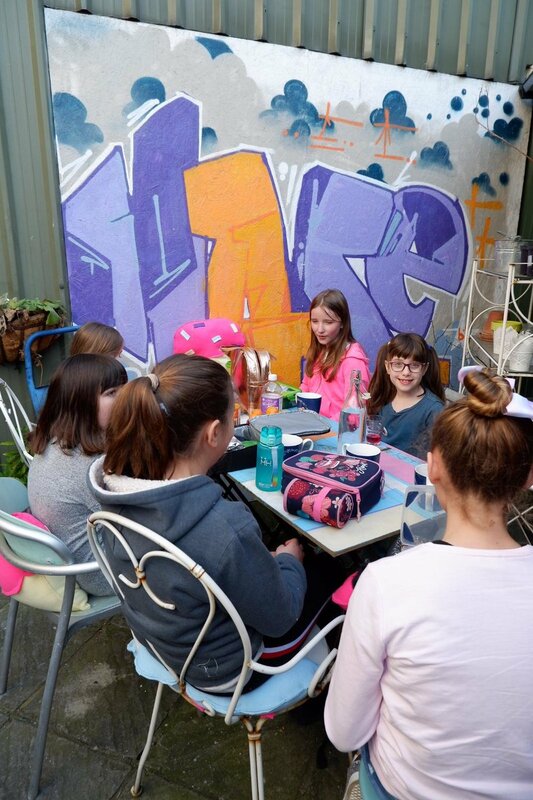 •We tailor the workshops to this specific age group so we ask that you email us if you feel your child is a different age but would still like to attend and we will consider each request. •Can I stay and watch the workshop? •We find that children do not gain the most from the experience if their parent is present, we can assure you that they are in safe hands and you will enjoy returning at the end of the day to see what they have created. •Are the tasks suitable for boys and girls? •Yes, we ensure all the activities offered would be enjoyed by boys and girls and we have a huge range of fabrics and materials to ensure everyone makes something that matches their personality & style.